View More In Safety Face Shields. 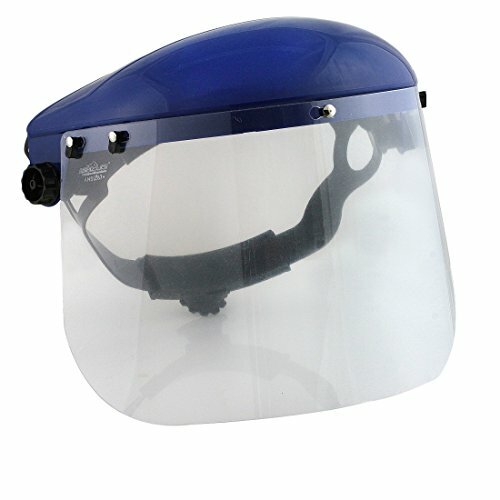 BISON LIFE Safety Headgear with Clear Polycarbonate Face Shield meets ANSI Z87.1-2003 standards without obstructing your field of vision. The headgear is fully adjustable for the perfect fit with a 5-position crown strap and ratchet adjustment knob in the back. Comes pre-installed with a BISON LIFE replaceable sweatband for comfort. The flexible polycarbonate shield comes with a removeable protective sheet to protect from scratching during shipping that should be removed before use. The high-strength thermoplastic crown is built to last and allows for replacement or exchange of the face shield within seconds. If you have any questions about this product by BISON LIFE, contact us by completing and submitting the form below. If you are looking for a specif part number, please include it with your message.